This was one of those parties where I wasn't in love with the theme (birthday boy Scrag's choice) until waaaay down the track. But as the plans began to come together and the ideas started flowing, the more excited I got about it. Of course my excitement was NOTHING compared to Scrag. He's been counting sleeps for months, and as Miss Fab and I got stuck into papier-mâché-ing piñatas and hot glueing googly eyes on ninja lollipops, the more excited he got - which meant the more hugs I got. (It's the reason I do these parties, really, for the hugs and the exclamations of "Mum you're the best! Mum you're so clever!" Makes it all worth it). Finally the birthday party day dawned, just as rainy as predicted. But was I fazed? Nuh-uh. I spotted the weather forecast earlier in the week and adjusted my decorating plans accordingly. Woop! I'm learning! There was NO STRESS about the rain. For once. Cos I was prepared. 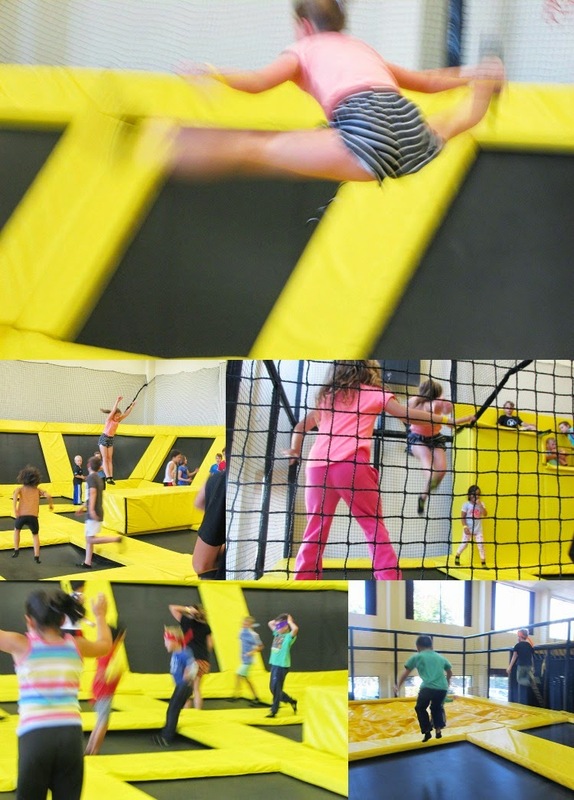 3.00pm-4.00pm - Have the BEST TIME EVER bouncing off the walls, literally. 5.00pm - Eat party food, sing happy birthday, blow out candles on cake. 5.30pm - When the wall bouncing starts again it's Daddy Ninja to the rescue: start silly dancing in the bedroom. Play "Bullrush" when the rain has stopped. 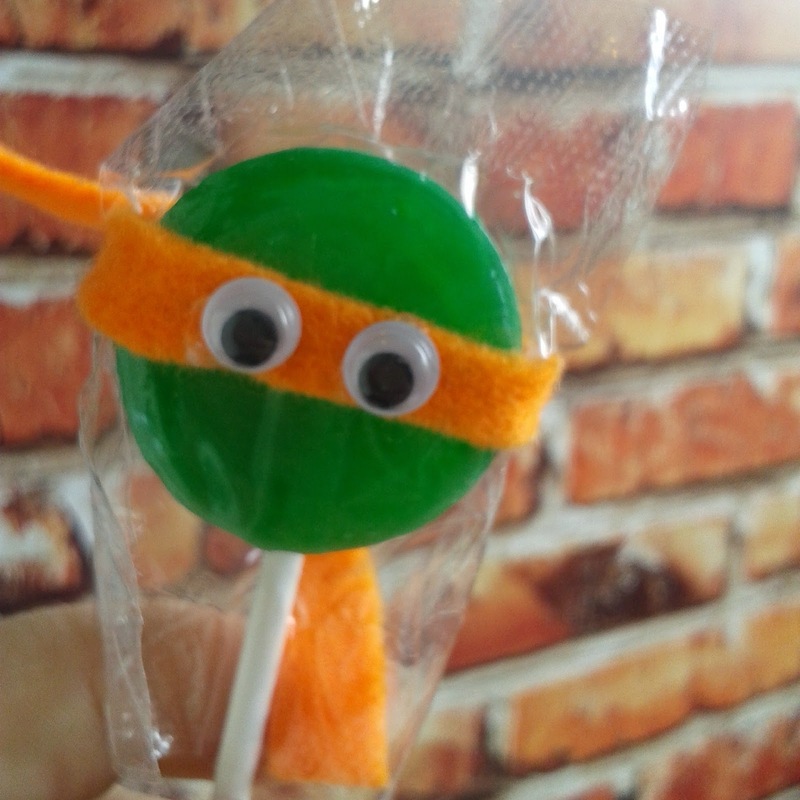 5.45pm - Play "smash the ninja turtle piñata" and send them home ASAP (before the sugar rush kicks in). After I saw the weather forecast (rain) I dropped all pans for outside party decor and figured out a plan to ninja-fy my dining room. 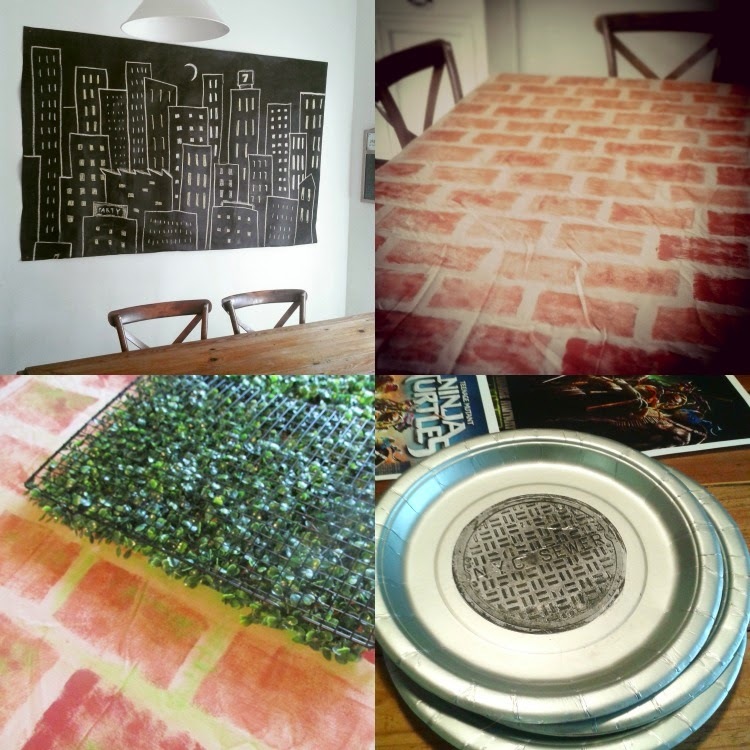 I had a cunning plan to stencil myself a slimy brick tablecover, which turned out rather brilliantly (if I do say so myself), but the pièce de résistance was the city skyline I drew freehand with chalk, on a sheet of black building paper, to form a backdrop. 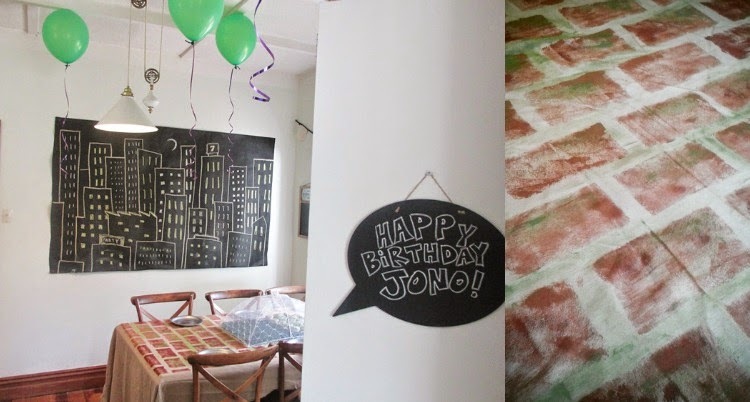 On the ceiling were "floating" some green faux-helium balloons, to add a festive touch. You'd be surprised how many people are fooled by these beauties. 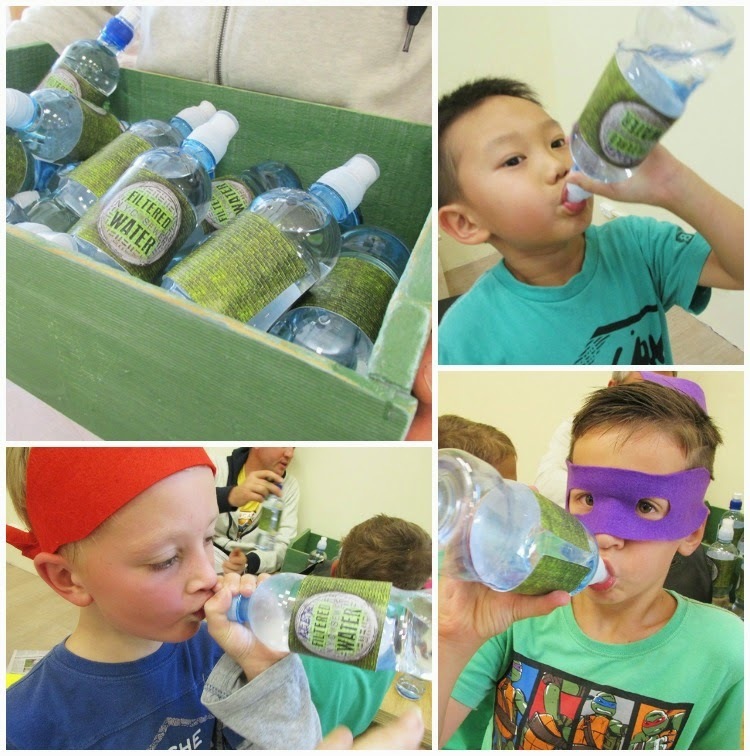 LITTLE TOUCHES: I used a Sewer Lid graphic I found online and played with it in Photoshop to create a number of fab printables for the TMNT party theme. I printed them and used them on the metal lids of my glass drink dispenser and mason jar cups, as well as a larger size stuck on the plates (covered first in clear Duraseal to avoid any toxic copy-toner getting on the food). Googly eyes were my best revelation though. 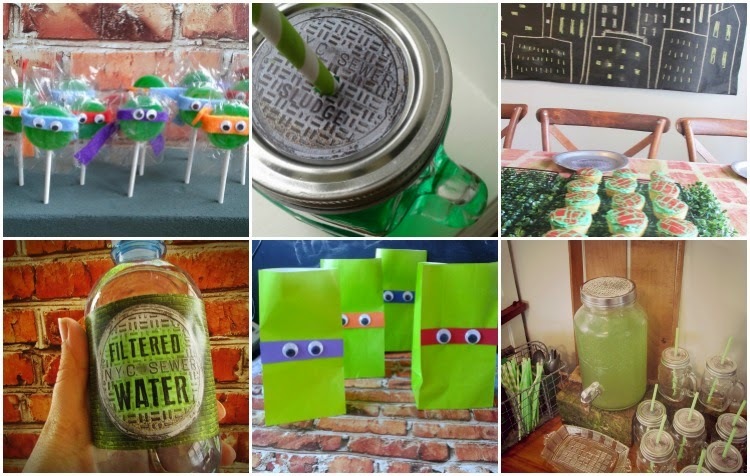 Two packets in various sizes transformed plain green bags, lollipops and popcorn boxes into super cute ninja turtle wannabes. Thank goodness Ninja Turtles love pizza! 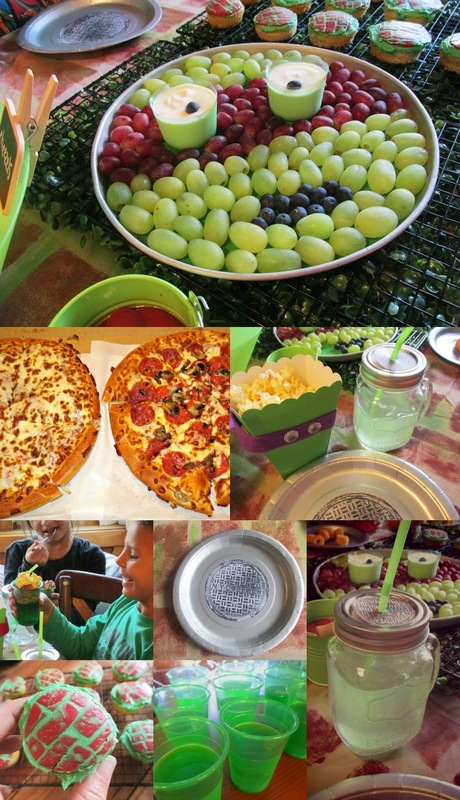 With that as a given, we supplemented our party menu with a few other faves: Popcorn (in ninja turtle popcorn boxes), cupcakes (slimy brick pattern, not to be mistaken for turtle shells), turtle-face fruit platter (instructions here)) and green jelly (cos it looks like slime). The pizzas we pre-ordered online and picked up from Pizza Hut on home way from Uptown Bounce for $5 each. (Pizza Hut, because that's what Ninja Turtles eat in the movie). TO DRINK: I made my famous green tea apple punch (refined sugar free), and branded it "Sewer Sludge". A few drops of green food colouring gave it a nice green tinge, and the name didn't put them off. they guzzled it back, no probs. (Yes that's an actual mossy brick from the garden that my drink dispenser is propped up on. Nothing like a bit of authenticity). 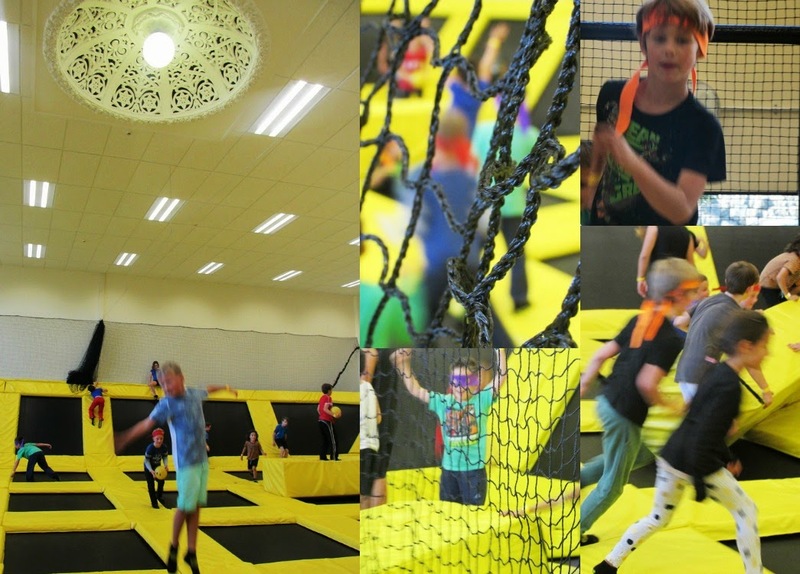 This party was partly held "at home" (we love at home parties) but also off site at the awesome new indoor trampoline place, Uptown Bounce. Thank goodness we planned this in! These young ninjas were LOUD. So much energy, even before having any sugar whatsoever. With heavy rain off and on all day there's no way we could have had an outdoor party, and with the amount of energy these kids had, there's no way my house (or my ears) would have survived! We've been here a number of times and the kids keep asking to go back again. 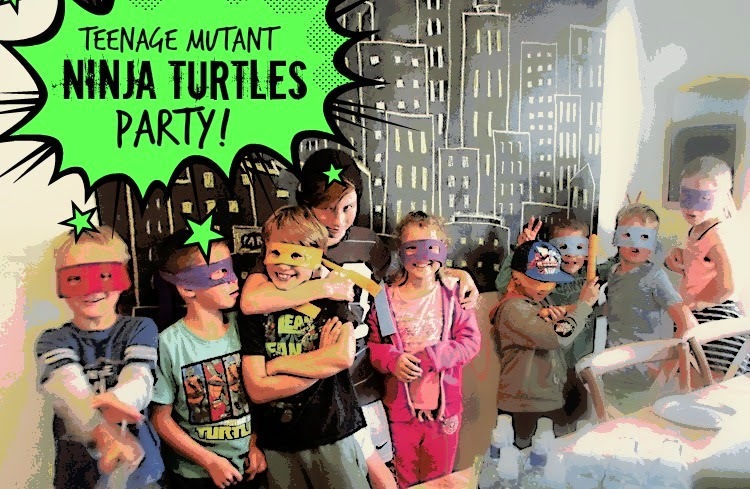 Scrag particularly requested that we go here for his birthday, and since it's just ten minutes up the road it was the perfect solution for an Autumn party with eight energetic kids AND a Ninja Turtle Party theme. 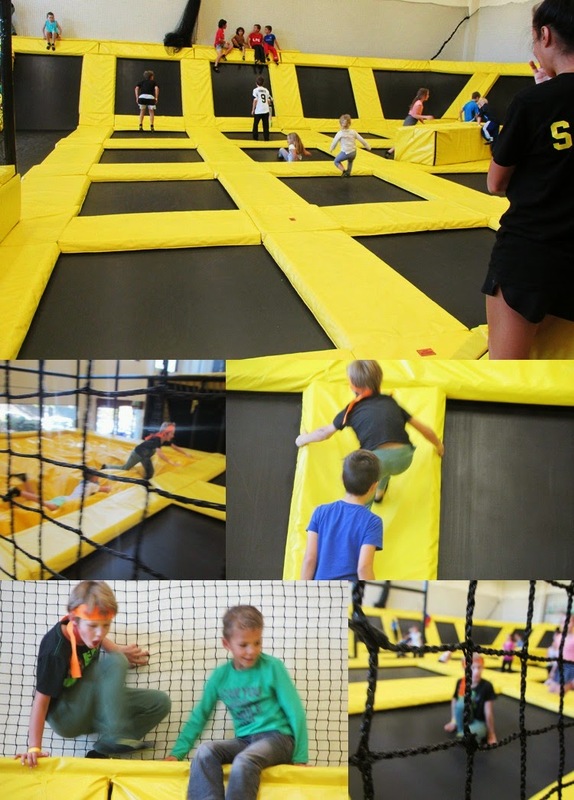 What I love about Uptown Bounce, apart from being so handy, is that it's clean, bright and well run. The staff are great and keep a close eye on the jumpers at all times, enforcing the safety rules which helps everyone have fun. Plus, it's not too big and not too small. It's just right. After an hour of non-stop action, we headed home for food and a few gentler pursuits, hoping that at least SOME of the energy fizzing through these kids' veins had been released. What can I say? the kids had a blast. 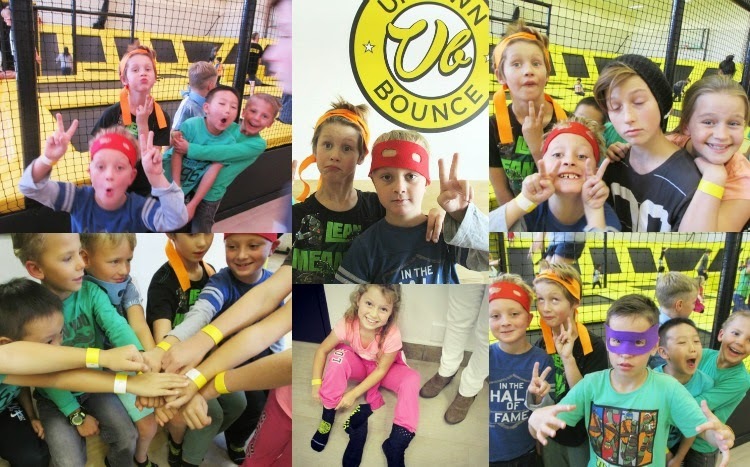 Thank you Uptown Bounce! Such a simple idea. 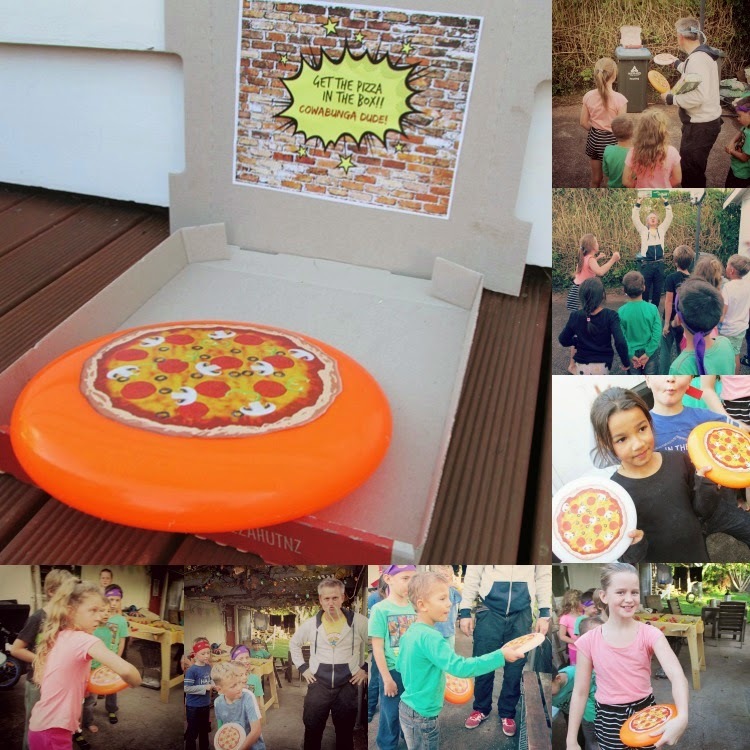 Turn a Frisbee into a pizza and try to throw it in to a pizza box. Hilarious to watch, especially with Daddy Ninja in charge of antics. 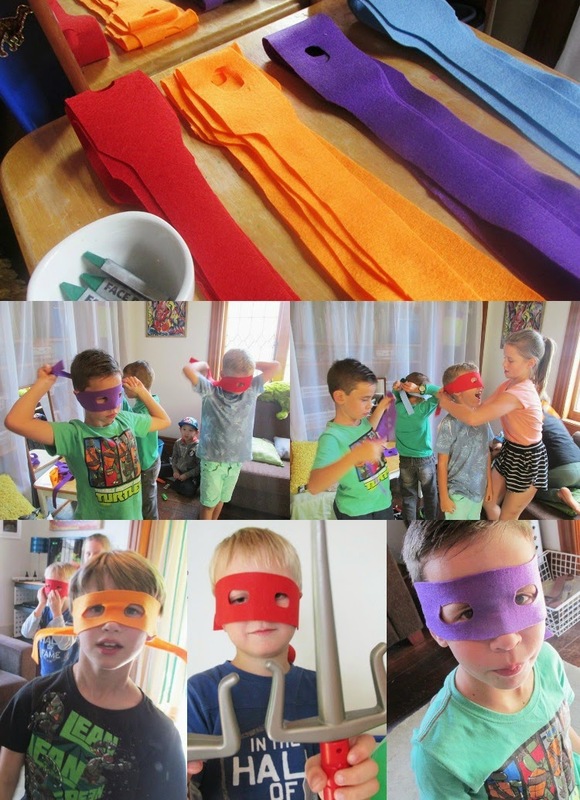 To top the party off and finish with a bang, Miss fab and I had lovingly created this rather cute Ninja Turtle piñata (here's how to make one yourself - it's ridiculously easy). Now this was the best fun to watch. What could be funnier than watching blindfolded kids attacking thin air? Great fun, I tells ya. When the piñata fell at last to a killing blow from the (plastic) ninja axe, there was a mad scramble to fill the otherwise empty goody bags with lollies, at which point we hoped their parents would arrive quick smart to take them home before the sugar high kicked in. 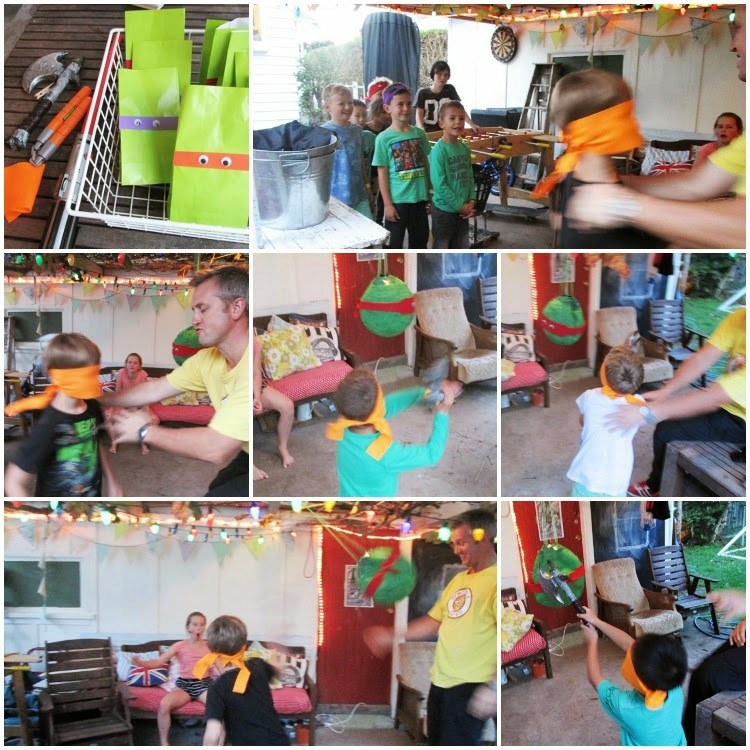 We sent our guests home with a green ninja-turtle goody bag filled with their piñata spoils, a cute ninja turtle lollipop and their felt mask. Simple. But we can't forget the Birthday Cake! This is one I'm rather proud of as I came up with the technique for the slimy-brick top all by myself. (Instructions for how to make this cake are here in my party how-to post). As I've said before, I'm a very amateur cake-decorator, but with the skills I learned and the equipment I got at KiwiCakes last month, I feel a lot more confident! 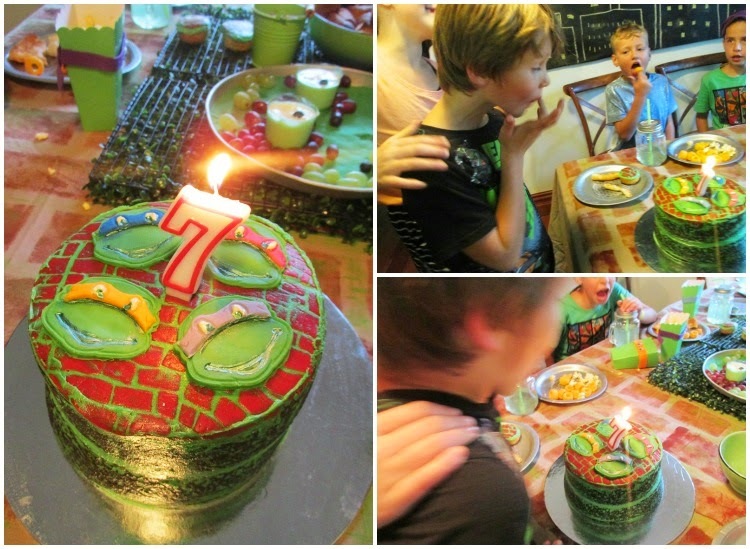 And the main thing is that the birthday boy loved it. There you have it. Another epic birthday production done and dusted. After that, I made myself a coffee and put my feet up, I can tell you.